While energy gels are more often used in endurance sports like running and cycling, my reason for reviewing this type of product on a hiking website is that I’m in the process of planning a long distance thru hike with consecutive days of big distances. From monitoring myself over the past few years on how my body reacts to big days on the trail, there are days where I easily burn around 8000+ calories. I have found on these big days that sometimes I just need an energy boost and products such as these come in handy. I recently reviewed the GU Energy Chews as well as the Clif Shot Blocks and was interested to see what the difference was with the gels as opposed to the solid forms of energy boost products. For those of you that have never tried energy gels before the best way to describe them is as a soft jelly like cordial. You definitely need a sweet tooth here and with some of the varieties a love of caffeine as well. 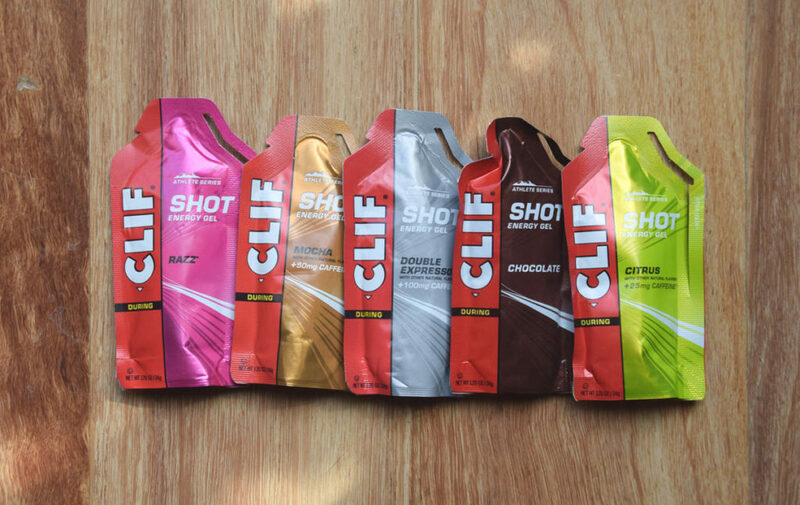 Clif recommends that you take one of these gels around 15 minutes before activity and then 1-2/hour thereafter. While this recommendation probably works well if you are racing on foot or by bike where it’s a bit hard to eat a proper meal I’m not about take take 11-20 of these a day for a big day out hiking. Where I do see these products being useful for is those times when you start to have a bit of a slump energy wise and just need a quick boost. The gels and Shotblocks will do just that and ideally while you would want to back that up with something more substantial there really isn’t to much else available that will provide you with as quick an energy hit. I usually get up at 4:30am each morning and have done for over 20 years, and as a result I tend to hit a wall in the afternoon at work and will usually go for something like chocolate but I tried these as an alternative. Between the different flavours I found that they all did indeed give me an energy boost, some more than others, and I certainly had those that I preferred taste wise which is what will dictate which ones I am likely to use again in future. I found that when I tried the Clif Shot Bloks or th GU Energy Chews it was too easy to eat the whole packet as they really look, and to a great extent taste, like giant lollies. For me the gels are one of those products that I will treat as an ‘as required’ product and not eat them just because they are there. This was the first of the gels that I tried and I found that the taste, amount of caffeine and the energy hit was the best of the lot. It’s definitely sweet and I can only say that I felt like I had just downed a can of V or Red Bull. In addition this energy was pretty instant. There can be no doubting the caffeine hit with this one. If you like your coffee extra strong, without milk or sugar then this is the one for you. While it did give me an energy hit I was more focused on the intense coffee taste. If you love strong black coffee then this one will keep you happy. If you have ever had a chocolate sundae from any of the fast food restaurants then that will give an idea on what the taste of this one is like. I also found the consistency to be a bit firmer as well. Definitely a Mocha taste that combines coffee with chocolate but without as much caffeine as the double expresso. This one was doable for me and just on the edge of being too strong to be unpalatable. In consuming this product over a period of days I also didn’t find any adverse digestive responses which is something I wanted to confirm before committing these to a hike. Having said that this should be something you test out and see what your response would be. Listen to podcast episode 057 Nutrition on the trail for additional information on supplements and hiking. Would I use this product? Not as part of my normal hiking but on those days when I’m trying to cover big distances, over long hours I will definitely include them as part of my nutritional intake.